New US sanctions have already proved very costly for one Russian oligarch. Listed companies controlled by Oleg Deripaska have lost over $6 billion in market value since they were hit with the sanctions on Friday by the Trump administration. Deripaska, a billionaire who once had close ties to President Donald Trump's former campaign chairman Paul Manafort, is one of seven oligarchs who were sanctioned as part of an effort to punish the Kremlin. The sweeping penalties also included sanctions on companies that the US government said are owned or controlled by Deripaska, including three that are publicly traded: EN+ Group, Rusal and GAZ Group. Shares in Rusal, one of the world's biggest aluminum producers, dropped over 50% in Hong Kong on Monday, wiping roughly $4.5 billion off its market value. EN+ Group, an industrial firm that went public last year in London, suffered a combined 54% stock decline on Friday and Monday. Its market value in London has been slashed by $2 billion. Shares in the third listed Deripaska company, the commercial vehicle manufacturer GAZ Group, dropped 10% in Moscow. Privately held companies owned or controlled by Deripaska were also sanctioned. The new sanctions promise to make it much more difficult for the companies to do business abroad. Under the sanctions, Americans are generally prohibited from doing business with the companies, and people of other nationalities could face sanctions themselves if they facilitate transactions for the firms. En+ Group and Rusal both released statements on Monday that said "it is highly likely" that the sanctions would "be materially adverse" to their businesses. The two companies did not respond to requests for additional comment on Monday. On Friday, Deripaska described the US sanctions as "groundless, ridiculous and absurd." Related: How rich is Vladimir Putin? The sanctions are aimed at punishing Russian President Vladimir Putin's inner circle for interfering in the 2016 US election and other aggression in Crimea, Ukraine and Syria. The White House said targeted sanctions would help to ensure that Russian oligarchs profiting from the Kremlin's destabilizing activities would face consequences. It said Deripaska was sanctioned "for having acted or purported to act for or on behalf of, directly or indirectly, a senior official of the Government of the Russian Federation." Prime Minister Dmitri Medvedev said Monday that Russia would respond to the sanctions. 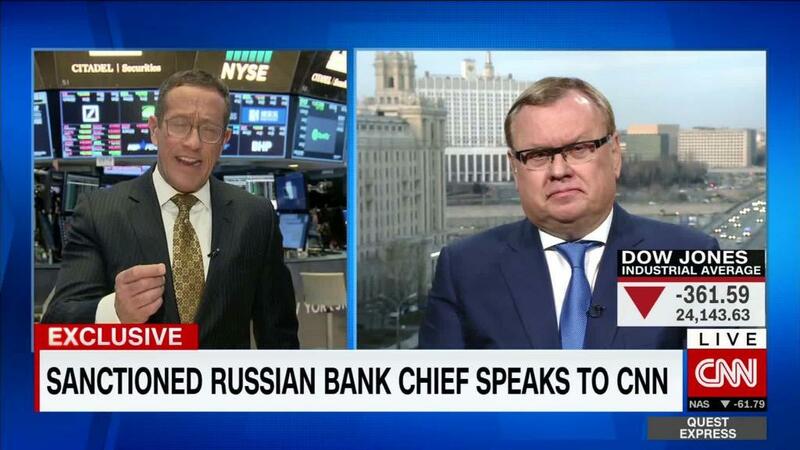 The sanctions were weighing on broader markets in Russia. The benchmark Moex index was down 7% on Monday, while the RTS index, which trades in dollars, dropped as much as 9%. The Russian ruble dropped 3% against the US dollar and the euro.